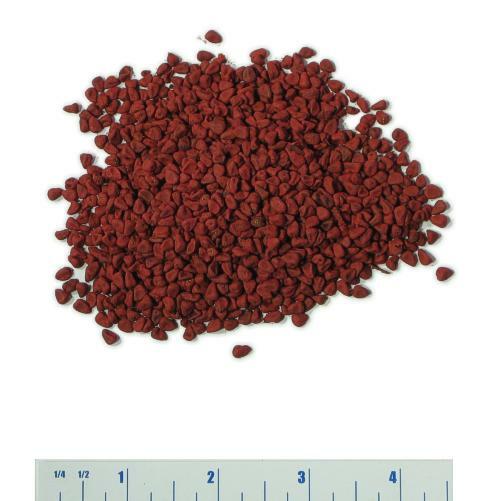 General Information: Annatto is native to South America, and is currently mostly in use as a flavouring and food colouring in Central and Northern South America. In the Caribbean, the seeds are usually fried in (animal or vegetable) fat. After discarding the seeds, the then golden-yellow fat is used to fry vegetables or meat. By this procedure, a golden yellow to golden brown colour is achieved. Mexican cooks often use a paste (achiote) of annatto seeds with some preservatives (acetic acid) that dissolves completely in hot fat. It is easy to use and can also be added to marinades and sauces to improve the colour. Similar use is found in South America, namely, Peru and Bolivia. In South Mexico (Yucatan), meat is often marinated with a spice mixture called recado that derives its vibrantly yellow colour from liberal addition of annatto. The annatto seeds may be used ground (often after soaking in hot water to soften them) or in form of annatto oil. Recado is made from annatto, dried oregano, ground spices (black pepper, allspice and cumin), garlic and fiery Yucatecan chiles. They key flavour is the juice of bitter oranges (also known as sour oranges or Seville oranges) which adds a distinct, acidic fruitiness. By Spanish influence, annatto also has made its way to South East Asia. On the Philippines, the seeds are often ground to a powder and added to soups and stews; meat is often marinated with annatto-coloured seasonings. The colour obtained hereby is brownish-yellow, less vibrant than the colour resulting from usage of annatto oil in the Caribbean. Besides Philippino cooking, the cuisines of South East Asia make little use of annatto seeds. In Vietnam, batters are often prepared with annatto oil to achieve a more attractive colour; annatto oil is also common for improving the colour of coconut-based curries. Lastly, there are Vietnamese varieties of Beijing duck, can be prepared with either duck or chicken that use annatto oil to colour the bird's skin. Chinese cooks produce a similar colour by treating the duck with malt solutions, which caramelizes during baking. In China, annatto seeds are occasionally contained in seasonings or marinades for grilled or fried meats (predominantly pork), resulting in a bright orange meat surface. History: The scientific species name orellana is derived from the name of Francisco de Orellana, a Spanish explorer of the 16th century. Together with Francisco Pizarro, Orellana had been involved in the destruction of the Inca Empire; in 1540, he participated in another expedition led by Gonzalo Pizarro. Following false rumours about gold and cinnamon trees, about 2000 Spaniards entered the Peruvian and Brazilian jungles, where most of them perished. Orellana abandoned the party and made his way eastward, where he (more or less by chance) discovered the Amazon River and earned scientific fame quite undeservedly.